Our work in the lab begins with analysis of indicative models (pictures from clinic are helpful). 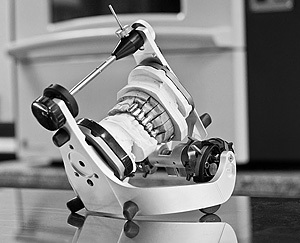 Models are installed in articulator according to relation from the clinic. Basing on this analyse doctor can suggest the patient some prosthetic solutions. We work on KaVo articulators. Next we make Wax-up of particular teeth. We restore the right vertical position, lost aesthetics. Basing on wax-up we are making a form to mock-up, silicone keys. Then doctor makes corrections in patient's mouth, takes impression, which comes to us. It is a model for us and basing on it we are making the final prosthetic work using different kind of fillings and materials (veneers, crowns, bridges on implants, cercon structures for ex. Pretau). Final result doesn't differ from the model and we focus on aesthetics and functionality. Very often our work changes patient's life - we could find out about that many times.